HeatWave exposes foods to only clean, filtered oil. HEAT and Control Pty Ltd’s HeatWave frying system cooks with curtains of oil for the highest product quality product and lowest system oil volume of any continuous fryer. Freshly filtered and heated oil enters HeatWave in multiple, gently flowing curtains. Only enough oil is used to enrobe foods, quickly transferring heat by dissipating the insulating layer of steam that inhibits heat transfer in submersion fryers. Although HeatWave uses less oil than other continuous fryers, it achieves the same level of cooking and colour development, according to Heat and Control. Ideal for nut meats and coated nut products, HeatWave exposes foods to only clean, filtered oil. Foods are physically separated from unfiltered oil and fines by a unique divider plate. One hundred percent of the total system oil volume passes through a filter within seconds, while continuous oil circulation keeps fines in suspension for more efficient removal. HeatWave's patent-pending design preserves oil quality and minimises cleaning costs. Fines are removed at the infeed end of the fryer to minimise oil degradation. 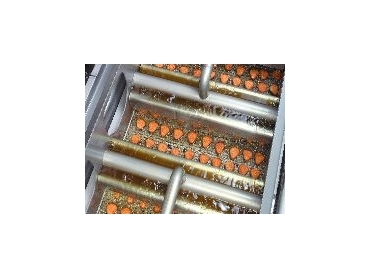 The returning oil flow and product conveyor that doubles as a full-width pan wiper continuously removes any fines occurring downstream. This avoids prolonged exposure to overheated oil and fines that degrades the flavour, appearance and shelf-life of fried foods says Heat and Control. HeatWave further reduces cleaning costs because it has no direct-heating elements or other obstructions in the pan that can accumulate fines.